In the nightmarish confusion, Mc Intyre, took a quite interesting note about Joe, noting his ' Mild expression of features' and also he clamed ' he had not the villainous expression of the others ' Many years later, Mc Intyre claimed that " Joe Byrne, was a nervous man thoroughly under the control of Ned Kelly. A part from the Kelly's bad example and bad influence he would have been a fairly respectable citizen "Mc Intyre, was obviously pleased by the way Joe acted towards him, Joe gave the shaken policeman tea, and asked him if he smoked, Mc Intyre replying " Yes " Joe replied to this by saying " Well, fill your pipe and have a smoke "
Joe Byrne, born in November, 1856, on the Woolshed diggings near Beechworth, his mother Margaret Byrne ( nee White ) was born in Ireland in County Galway. In July 1855, a Patrick Byrne married Margaret White, a 21 year old Galway woman, strong faced, with a pale blue for an eye color. Joe's father, Patrick Byrne, a 24 year old a Goulburn gold digger, Strong build, his eyes the palest shade of grey, his hands were strong and powerful. On that winter day in July 1855, at the Catholic Church of St Peter, and St Paul, the two were bonded, as one. Margaret signed her name, quite well and dense, Patrick who was illiterate, but, he had learned to sign his Christian name fairly well. After a long and hard move to Victoria from Sydney, Margaret and Patrick set up their home in the Woolshed Valley, a lovely spot just outside Beechworth, over populated town of 4,000, over 150 businesses, ten hotels, seventeen restaurants, and also a professor of music, just to name a few. On a warm summers night, in November 1856, Margaret bore a son, in a tent, or temporary homing, the child was born, he was named Joseph Byrne, but he would always be known as Joe, this young handsome child, would be the best friend and lieutenant of, Edward Kelly. When young Joe was ten months old, Margaret and Patrick, yet had another child, his name was John, quite a small child, un healthy looking, little John only lived 25 days, before his death. This was a blow to the family, and the local community, once again when Joe was 3, another child was born, she was named Catherine, this one sustained health and was able to survive, the 19th century harshness, and would live on to be another prominent name in Joe's life. Patrick probably tried his hand at gold mining once again, and, more than likely he worked alongside a mate by the name of Phillip Riley, who took up a gold claim just below the Byrne Homestead. Not long after this, on 17th of March 1862, St Patrick's day, Margaret gave birth yet again in Chilten, he was to be named Patrick, more than likely after his father. Already at age 6, Joe was becoming a handsome boy, his pale blue eyes and his tall strong body, made him a remarkable individual. In the year of 1864, a Chinese community, had developed in the Woolshed, in fact no less than a mile from the Byrne homestead, a small Chinese community had began, 20 or so Chinese Miners lived here, they had a sluice which ran directly through the Byrne Homestead, the family took some of the water. Soon Joe was among the small community, nicknamed ' Ah Joe ' eventually he learned Cantonese and could speak it quite fluently. Around this time a new family had settled in at Woolshed, The Sherritts. Their first boy, Aaron, would, be a good mate to Joe and, be a major part in Joe's destruction. Soon Joe was at schooling age, and on the 27th of January 1862, Joe attended the new Catholic church/school at Woolshed. Perhaps it was here Joe met Aaron Sherritt, a young lad who's family had just settled in at Woolshed. Their teacher was Cornelius O'Donoghue, soon Joe became a ' flash ' writer and loved to write. Joe and Aaron were a ' Naughty ' pair, they would explore the ranges above, skim rocks across the creek, and find secret hideouts, and perhaps, played, ' Cowboys and Indians ' together in these magnificent granite boulders which formed caves. In 1946, Kelly researcher Max Brown spoke to the remaining people who remembered the pair of mates said of Joe " a quiet, intelligent, lithe youngster, clean and tidy in his habits, a little old fashioned and grave in his ways "
In 1866, Patrick Byrne, Joe's father had developed a serious condition of heart disease, as Ian Jones put it in " The Friendship That Destroyed Ned Kelly" " The trauma of of his fathers first heart attack may have been reflected in Joe's school work. On 13 May 1866 this boy who was usually first or second in his class, came last, with a pass in only reading "
In 1869, Joe only passe d in arithmetic, spelling and writing, and failed his usual favorite subject in reading. Meanwhile, Joe's father Patrick, his heart disease became worse and he died in the Ovens and District Hospital in Beechworth. Joe helped his mother best he could, as much as sleeping with her for comfort, over the next hard, few months. Another daughter was born, on the 7th of February 1871, she was Christened Ellen. She would be the last, of the Byrne's, living to a ripe old age of 93. Joe and Aaron became much closer - Aaron, the flash, now, man, and Joe, a intelligent, handsome, young bushman. Suggestion has it that around this time, Joe while becoming very well known in the Chinese community, may have taken a addiction, to opium. Opium a type of Poppy, a flower, which was smoked through a long pipe, inhaled and the exhaled. Around this time, Joe mad his debut appearance in a court of law, on the charge of " Illegally using a horse" and was fined 20s with 1s 6d and to find himself in prison for three days unless it was paid up - front. Joe had a lucky scrape with the law; he was lucky to get out without imprisonment, as Judge Pitcairn warned Joe " But in this case, he would inflict a fine, warning him on appearing in court on such a charge"
Then, a report that a white cow, had gone missing from Eldorado Common scho ol, Aaron and Joe were see cutting a cow that evening, the witness, a red haired Scotchman, sworn in court Joe and Aaron were cutting the Eldorado common schools cow. Joe and Aaron were sent to Beechworth prison, for 6 long months, the cold place must have been a horrible experience. Soon after their release, Joe and Aaron more than likely met up with Jim Kelly, Ned's brother, after Jim's release from prison, they met up, and Jim was hoping to get some work at ' Bourke's hole Saw mill ' The mill, in fact had just ceased operation, and this is more than likely where Ned, Joe and Aaron met for the first time. Dan Kelly, Ned's younger brother, had discovered an old deserted gold claim on Bullock Creek, it consisted of a bark hut, and a race around it. There was obviously a lot of work being done at the Bullock creek hut, including target practice.
" On one small tree a circle of charcoal 6 in. in diameter had been traced, and into this two or three revolver bullets had been fired, on striking the black dot meant to represent bulls-eye in the centre, and the other two being close to it. " As, Aaron, Ned, Joe, Dan and a handful of friends including Steve Hart, one of Dan's good mates, were working the gold claim off and on, until a mysterious incident took place at the Kelly Homestead on April 15 1878, when Constable Fitzpatrick claimed that Ned burst through the door, and shot at him, and hit him in the wrist, and Ned's mother, Ellen, hit him on the head with a shovel. 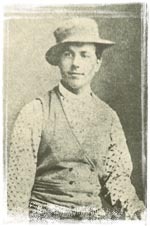 Constable Fitzpatrick was under the influence of drink at the time of the incident. Mrs Kelly,was sentenced to three years hard labour, in her majesty's gaol Melbourne. William Williamson and William Skillion were sentenced to six years hard labour each. Mrs Kelly at the time had a new born baby at her breast, but the harsh sentence proves the injustices the Kelly family, relations and friends went through. Ned and Dan, went to the Wombat Ranges almost immediately after the strange incident. A reward was offered for there capture, 100 pounds, Ned and Dan, were in fact at Bullock creek. The long hard days and nights, turned from Autumn, to winter, and it got colder, Joe seemed to have stuck by Ned the whole time, as the ever weary days drew on, search parties were constantly at the Kelly Homestead, until finally, on Friday 25th of October 1878, Ned came across some tracks, with police issue shoes, one set of tracks, Ned discovered, leading out across towards Holland's creek and also, Toombullup. The second set, as Ned swung his horse around near Emu swamp, and headed westwards back towards Bullock creek, this set was seen heading towards a old hut on Stringybark creek. That night, the boys, Ned, Joe, Dan & now included Steve Hart, a jockey from Wangaratta, expert horseman, and became known for his ability to be the only one to leap the slip rail fence of the Wanagaratta Station, probably got little if not, no sleep that night, Ned sat up all night, early next morning, Dan and Ned, headed towards Stringybark, and discovered the police party near the old hut. They headed back to Bullock creek, warning Joe and Steve, and possibly, feeling that there maybe be a siege, to leave, if so, it didn't work, and, at around midday, shotgun blasts roared out of the gully at Stringybark, what were the police shooting at? Ned wanted to find out. Ned, Dan, Joe & Steve headed towards the spot Ned and Dan had discovered earlier, hiding among the speargrass, Joe, was behind Ned, not a far distance away from Joe was Steve, Dan was also to Ned's right. As the gang watched to two constables for a while, they eventually, decided to move in. The call could be heard exiting Ned's mouth, Constable Lonigan, whom was sitting on a log, almost dead in line with Ned, immediately fell on his back, and rolled behind the battery of logs he was sitting on, he may have checked to see if his Welby pistol had bullets in it, and with that, popped his head up, and took aim at Ned. Ned, fired before Lonigan had his chance, and hit him in the right eye, Lonigan, crawled along the ground, crying ' Oh Christ, I am shot ! ' the crawl ceased, and he dropped dead. Mc Intyre, the other constable sitting on a log, quickly through his hands up, as the gang searched the camp, they found Mc Intyre was alone, and asking of questions followed, Mc Intyre, told the gang that a Sergeant and a Constable were on their way back to the camp, from patrol, and are expected back soon. Many years later, Mc Intyre claimed that " Joe Byrne, was a nervous man thoroughly under the control of Ned Kelly. A part from the Kelly's bad example and bad influence he would have been a fairly respectable citizen "
Mc Intyre, was obviously pleased by the way Joe acted towards him, Joe gave the shaken policeman tea, and asked him if he smoked, Mc Intyre replying " Yes " Joe replied to this by saying " Well, fill your pipe and have a smoke "
Joe and Mc Intyre smoked and chatted for the passing minutes, until Ned joined them, and Ned began asking questions about Kennedy and Scanlon, the two police on patrol. Within the half of an hour, they heard hooves of horses cluttering up through the bush. Dan and Joe went back and hid in the long sword grass, Ned hid behind a fallen log near the fire, and Steve took cover in the tent. Mc Intyre, approached Kennedy and Scanlon, who were still on Horseback, he warned them they were surrounded and had better surrender. Kennedy, said to Mc Intyre " Surrounded are we? " Suddenly, Ned sprung up, and shouted " Bail up " in an instant Constable Scanlon un hitched his Spencer repeating rifle and fired a shot at Ned, the gang had all left their covers and we re yelling at the police, telling them to surrender. At this time, Kennedy, had leapt off of his horse and was firing from behind it. Eventually, his horse frightened, took off in full gallop, Mc Intyre, seized the opportunity, and leapt on Kennedy's horse, and rode away. Leaving Kennedy to fight it out.